My local supermarket, which is nationally recognized as being both great at customer service and also great at appearing green to its customers, has finally recognized that customers who use reusable shopping bags impose costs on other people in line by making the lines move more slowly and on the checkout staff by making it harder and more time consuming to move items from conveyer belt to bag to cart. So, in response, it turns out that the supermarket, when things are busy, such as they are on a winter Sunday morning, keeps a staff of extra checkout clerks, at the ready in order to do the bagging and packaging when customers bust out their reusable bags and to keep lines from getting long and keep them moving more quickly. I eyeballed 3 to 4 staff members roaming around the back of the crowded checkouts this morning. The store also did not appreciate me snapping the photo. 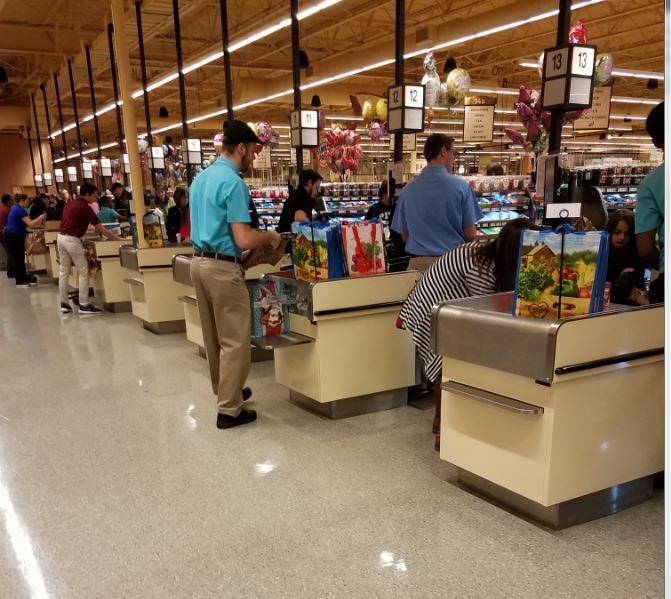 As a general rule, I do not even care how long a supermarket line is anymore, I only examine whether the customers in front of me happen to be using reusable bags, my estimate is that on average for every two customers using them, that is the equivalent of three customers who do not. 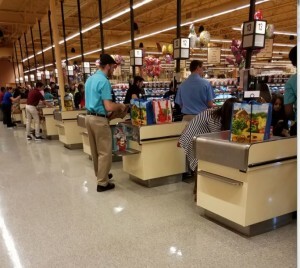 Wegmans surely has the data on this, and it would be very interesting to see it – but in any case, the proof is in the pudding – the fact that they employ staff to help those lines move more quickly, when the trend in supermarkets for decades has been to eliminate the use of baggers, suggests that these are quite costly. Finally, this is what “Make America Great Again” means, but imagine it writ large. Making trade with other countries more difficult, and workshipping at the altar of manufacturing jobs in America imposes costs. No doubt the MAGA crowd would point to the clerk in the picture as an example of everything that is right about their anti-progressive policies, those with an understanding of economics will rightly ask, “at what cost?” Instead of packaging those employees could be offering better service, prices could be lower, or we’d have employment expanding elsewhere. Would the folks who are ardent supporters of plastic bag bans and using reusable bags like to align themselves with Trumpist-economics? The great benefit of the current Administration existing is that it really does put economic ignorance on display and also challenges opponents of Trump to come up with reasons to hate Trump OTHER than the fact that his economics are bad. Why? Because there tends to be an economic illiteracy among holders of almost any policy positions, but there is no way “they” can get themselves to oppose a hated enemy on the grounds that his economic ideas are bad, because they too hold those same ideas (e.g. protectionism). I don’t really see he mechanism that would make reusable bags take longer? If anything , I’d have thought it would take less time since they can take more items, so you can just toss stuff in. Also, in addition to plastic bags, they’ve removed the handles on the paper bags at my local trader Joe’s and stop and shop. I suppose it probably lowers cost of production, but the cynic in me assumes it’s meant to be a further deterrent. Oh, the reusable bags are CONSIDERABLY slower. They hold less per bag, they are less pliable, plus the time to take out of cart (and believe me it takes time for customers to get themselves together) and then one by one stand them up and keep them open on the same platform as the plastic bags, which at most can only handle 2 at a time (at which point you need to stop to reach for more bags) … and the loading is much slower. This is wholly aside from the lost environmental benefits because these bags need regular washing, especially when raw meat is being put in them.